Capt. David Vasichko, Kyle Duckett, and Casey Faircloth with a wreckfish. 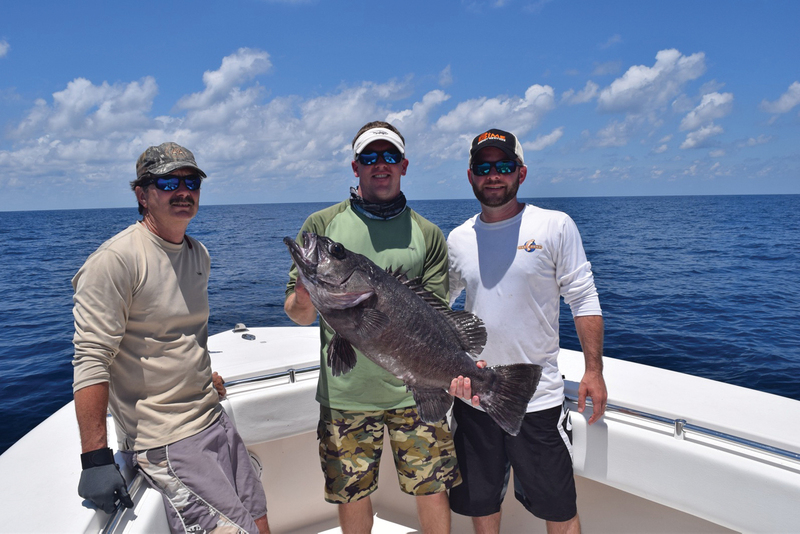 The warm summer months and well into autumn offer one of the most fun types of fishing in the offshore waters of the Gulf of Mexico and that is bottom fishing. In many areas of the world it is called reef fishing, as anglers concentrate more on bottom dwelling fish than those that feed closer to the surface. While there are reefs in the Western Gulf, most bottom fishing is around underwater structure such as rocks and surface structure such as oil and gas wells and production platforms. Regardless of what type of bottom structure you fish, the pleasures and frustrations are the same. One of the joys of bottom fishing is that you never know for sure what you are going to catch and often some amazing fish are brought to the surface from the deep waters. This type of fishing has a good side and a bad side. We just mentioned one of the good aspects; however, the bad side is that there is such a wide variety of fish down there, that hardly anyone can identify all of them. The problem is that many of those fish that are unknown to the angler have strict size and bag limits attached and often you may catch a fish that cannot be retained or is under or over the size limit without realizing it. 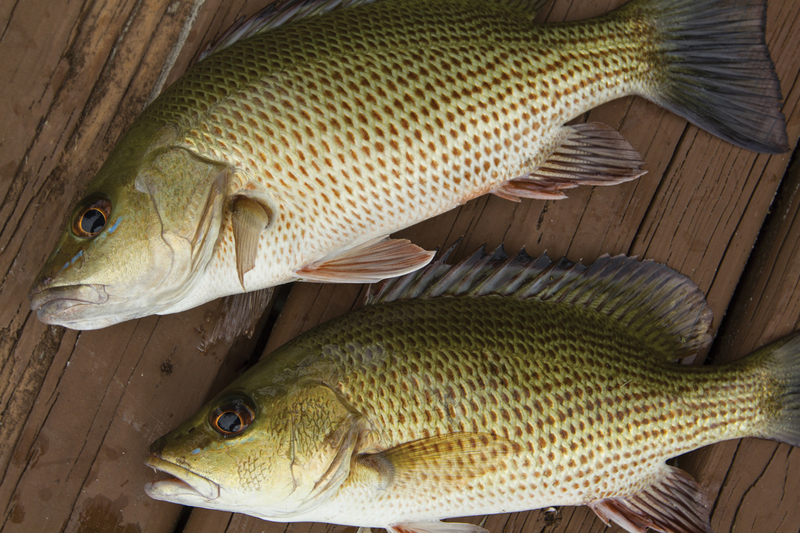 Tasty mangrove snapper are open to Gulf anglers all year long. This also holds true for a large variety of fish that are easily identified yet the angler is not aware of the ever changing regulations that govern fishing in the Federal Waters of the Gulf of Mexico. Under this same scenario, there are many fish that would have made it to the record books albeit for the fact that the existing record was unknown to the fisherman. Additionally there are a lot of fish swimming the deep that have not been entered into the record books regardless of size. Well, fortunately for a group of four anglers, recently fishing the offshore Gulf waters out of Galveston, one of them had a familiarity with saltwater fish that rivals an encyclopedia of fishes of the ocean and that knowledge paid off big time and not in dollars. Kyle Duckett, Casey Faircloth (son of the state representative), Capt. Dave Vasichko and his son Capt. Sean Vasichko were on an offshore trip recently fishing 65 to 130 miles out of Galveston when Duckett landed a first for the Gulf of Mexico, a wreck fish. Capt. Sean or “Seavas” as he is called knew the identity of the fish when it was brought to the surface and as a result Duckett now owns the State of Texas record for the largest wreck fish caught in the Gulf of Mexico and “First Fish Award” which means it is the first reported catch of a wreck fish in Gulf waters. Wreck fish look like a cross between a large seabass and a grouper. They are excellent table fare and very popular along the East Coast, especially the Carolinas. They are highly regulated in Atlantic waters; however, since they are not typical for the Gulf of Mexico, there are no recreational regulations on the fish. Actually, I tasted wreck fish at a restaurant in Charleston, South Carolina ironically called The Wreck Fish. Duckett said that his wreck fish was caught approximately 20 to 30 miles south of the Claypile, a popular fishing area approximately 75 miles out of Galveston. Conditions were calm on the surface; however, a very strong underwater current prevailed in the area. Although Duckett did not mention which bait the fish hit, squid and chunks of cut bait were the baits being used at the time. Duckett could easily have missed knowing these facts and either tossed the fish back or fileted it for a meal. On the other hand, this fish could have been under a size and bag limit unknown to the angler from League City and when inspected by a game warden, a sizeable citation would have been issued. Likely the most common fish that would cause these mistakes are sharks. If you look at the regulations on sharks, you can see why. Although difficult to recommend, if you are not familiar with a particular species of fish caught offshore, the best procedure is to release it; however, most anglers feel that is the best strategy. In the process of either releasing or retaining, I have to believe that a lot of state record fish are caught and either released or devoured at meal time. A way to help avoid any of the pitfalls mentioned above is to carry with you a copy of the Federal Fishing Regulations for the Gulf of Mexico waters, along with a good fish identification publication. Have fun and be knowledgeable when you bottom fish.